Knowing the “where”, “when”, and “how” are the most asked questions and importantly so. I’m going to give you my 2 biggest secrets for these larger fish: Location and Time. Figuring out those two combinations are a ticket to bigger Trout – let me explain. Time of Year. As waters warm, Trout (as well as all the other cold-blooded fish) will begin to move about and feed more actively. 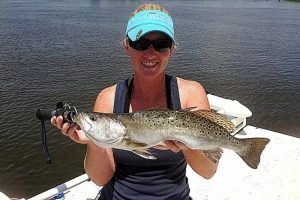 At upper 60s-low 70s, Speckled Trout “biological clocks” alert them to spawning rituals and to forage more because of this higher energy cost. 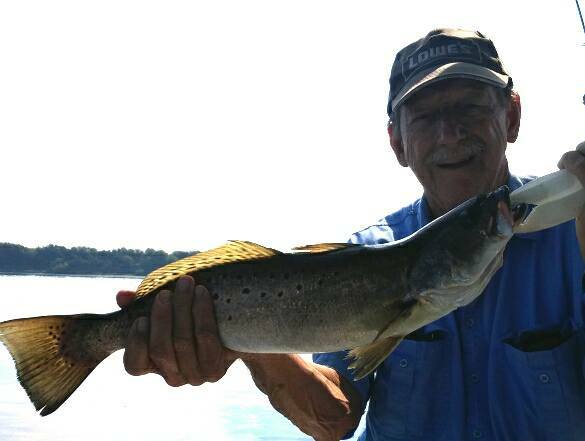 Spring Trout catches are typically big plump females reaching up to 8-10#! Male trout are usually a little smaller. And yes, you can catch Trout all year, with trophies again in the Fall too, but I begin targeting big Specks in the Spring. Location. Inlets, oyster beds, grass beds, shell banks, areas with a decent salinity and water movement are ideal. With that said, I lean towards Inlets in April to start the season. Why? The water is deeper, cleaner, and saltier, but also because baitfish begin gathering through these channels. Like we know, larger fish will be on those baits. In the Inlet, I prefer the three hours of slack tide, positioning my boat so I can (1) get out of any ripping currents especially if it’s not slack yet, and (2) cast out onto areas of old marsh, structure, and deep holes that are hidden by the high-water line. 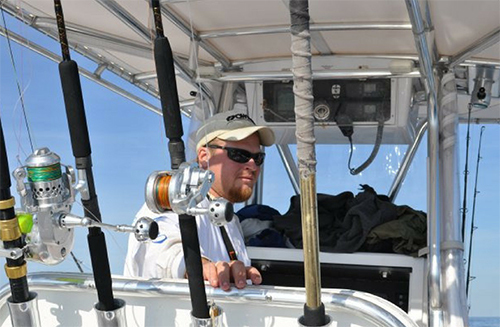 A tip for fishing the Inlet, waterways, and ICW docks other than tide is time of day. Go early and go late – the less sun glare and boat traffic on the water, the more larger fish I have caught in those areas. Traffic and boat wakes will put those fish off from feeding there. As May approaches and turns into Summer, the water temp is continuing upward, move further inshore as these fish are doing the same, many following these baits as they swim into the River. Get further in the creeks off the waterway, go into the canals, go fish in the Cape Fear River – those will be more peaceful (for you, and the fish) and same type structures will be productive through the Fall. Now the “how”. Keep in mind earlier season Trout are not as picky as they know they need to eat to replace energy costs from spawning. Live baits such as larger 4” mud minnows, mullet, palm-sized pogies, and shrimp pinned on circle hook Carolina rigs are tried and true, and don’t overlook the gold and silver Johnson spoons also. Dab a bit of scent on those lures for a little extra smell. Other artificials such as 4” scented shrimp pinned on jig heads will also attract a big Trout. Cast up to the structure and reel it back towards you mildly but not too fast. If you’re fishing around snags, oysters, or creek mouths, observe the water flow first, then cast your bait/lure towards the edges or ends of the current wash – this is where bigger Trout will stage to catch baitfish being washed out to them. Another favorite of mine is to attach a live shrimp under a DOA cork, cast it up-current and let it drift down with the flow. A couple notes: if water is moving too swiftly in an area, come back on a different tide stage. Wind can be an enemy as well – with a stiff breeze inshore, better catches are those from structure tucked out of the wind/current. There’s no one right way to catch big Trout – or any fish for that matter. This is how I go about targeting them and I hope some of you give my tips some thought and go catching! The Big Dilemma…… Live Shrimp, Live Minnows, Or Live Mullet?